About a week ago I wrote about the two big bottle-conditioned beers I brewed to commemorate the births of my children: Old Froglegs Barleywine and Gnome Brew Wheatwine. I set a reminder for myself to taste both of them on National Homebrew Day (May 7) and write up the results here. So here we are. Both of these beers were brewed for extended cellaring and aging. My master plan – probably a very bad plan – is to ration the bottles out slowly on special occasions and give the last bottle of each batch to my children on their twenty-first birthdays (never let it be said I don’t think long term!). I say “probably a very bad plan” because I suspect that after twenty-one years, it will be little more than fancy-pants malt vinegar in the bottle that I give to my kids … in which case I’ll gladly help them fry up some fish and sprinkle the ancient beer on some chips. So maybe twenty-one years is too ambitious. But as they were brewed with aging in mind, it’s not too surprising that they’re both still getting better. In fact, the barleywine – which just celebrated three years since its brew date – seems to be getting close to its peak. But I’m getting ahead of myself. Brewed April 29, 2013. Bottled December 6, 2013. Old Froglegs poured a deep, cloudy mahogany with little carbonation and no head retention. Sniffing it was a delight, and I just wanted to crawl into the glass and explore its complexities – black cherry, tamarind, a cordial aroma like Grand Marnier. Brewed February 23, 2015. Bottled November 2, 2015. A bit lighter in color than its older brother, Gnome Brew poured more of a dark bronze color. Similarly lacking in carbonation, and with no head retention. The aroma was nowhere near as complex, and there wasn’t much aroma to speak of at all. I got a hint of apple and pear, but that was it. Not green apple like the acetyldeyhde tang of green beer, but a riper, fruitier apple … but still pretty ordinary. There was a hint of alcohol on the nos as well. The flavor was good, but coming on the heels of a well-aged barleywine, it was unfortunately lacking. A bit boozy – not at all a surprise given this has been aging in the bottle only seven months – and with a thinner mouthfeel, so it lacked that delightful “cordial” quality of the barleywine. There are good flavors in there: cranberry, red wine and/or port, a bit of tannin. And it’s much smoother than it was when I opened the first bottle at Christmas 2015. But it still has a way to go before it’s quite where it needs to be. I don’t have to tell you it was a lovely evening. The only better way to celebrate National Homebrew Day would have been actually to brew (but it was my son’s birthday party; see last week’s story for details). And it was a wonderful way to remember the past: how in the weeks after each of my kids was born, I rallied myself – against the lack of sleep, the struggle to adjust to a needy new person in the house, and the feeling of untethered confusion about the future that accompanies the birth of a child – to brew a batch of beer that would give me a long-lasting memory of the time. Both beers have certainly done just that. And what delicious memories they are. Check out the complete recipes for both beers in the Recipes section of the site. Next week, I’ll write about the homebrew we served on tap at the birthday party on National Homebrew Day: a simple and tasty hopped cider that’s perfect for a Texas spring day. Until then, cheers from myBrewHome to yours. 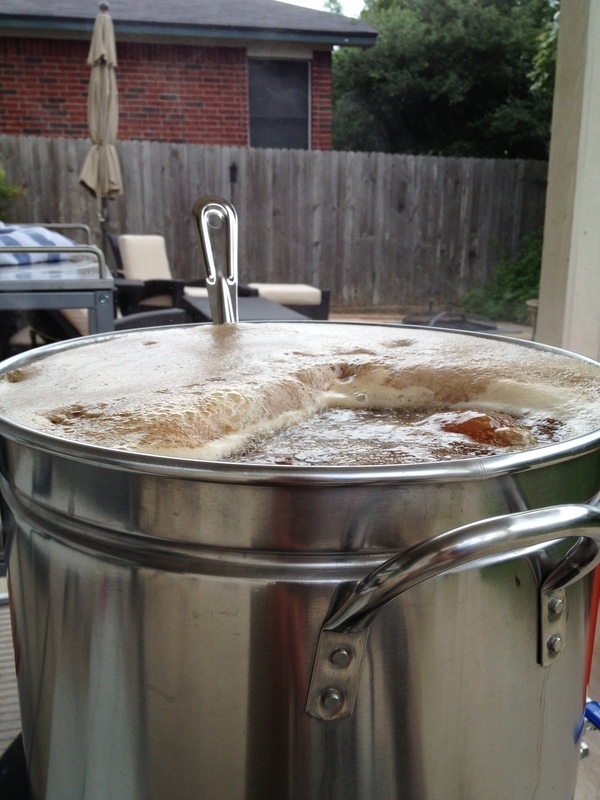 Saturday, May 7 is National Homebrew Day, which the American Homebrewers Association celebrates with its annual Big Brew. Homebrewers across the USA will head to their patios and garages to fire up their systems on the same day, like some coast-to-coast hive mind straight out of the pages of Arthur C. Clarke’s seminal science fiction novel Childhood’s End (but with beards and cargo pants); linked by social media and a common tipsy feeling. What better way to celebrate the fact that being a homebrewer has never been cooler in this country, that the brotherhood (and sisterhood) is growing faster day by day? Unless you’re like me, and you won’t be homebrewing that day. It’s my son’s birthday party. So I won’t be brewing. But that won’t stop me from enjoying a tasty homebrew, right? Oh, right. The broken kegerator. So drinking draft is out of the question. Fortunately, I do have a couple of bottled homebrews at the ready. For the past few years, I only bottle commemorative beers for cellaring, but I just happen to have a bottle each in the fridge of the barleywine I brewed to celebrate my son’s birth in 2013 (and bottled for sampling at future special occasions, such as his birthday … it seems almost like I planned this all along, doesn’t it? I didn’t), and the wheatwine I brewed to celebrate my daughter’s birth in 2014. So in honor of National Homebrew Day, I have decided to drink both of these big beers after the kids go to bed. Rest assured that two bottles of 11-12% ABV homebrew in a row should have me nice and tipsy like the rest of you. Solidarity, brothers and sisters. I wrote about Old Froglegs Barleywine back in 2013, and the recipe is posted here. Gnome Brew Wheatwine, on the other hand, has not yet made an appearance on this blog. So I’m posting the recipe below and a little bit of the story behind it. Story: I set a high bar for myself by brewing an American barleywine as my first homebrew after my first child was born. So when the second came along, I had to do something similar. And since I still had most of the barleywine in my cellar, I decided to do something “similar but different”, and brewed a wheatwine. Wheatwine isn’t exactly a style that’s littering the shelves at the local bottle shop. I first heard of the style when I picked up a bottle of Boulevard Brewing’s Harvest Dance, and found it lighter and brighter than a syrupy, boozy barleywine. So a wheatwine seemed like an excellent thematic companion and a flavorful counterpoint to the barleywine I already had a stock of. Comparing it to the above-linked recipe for Old Froglegs, I split the base malt nearly in half with slightly more wheat than barley, and replaced the body malts with lighter versions (Munich with Vienna, Crystal 60 and 150 with Crystal 40 and Caravienne). Chinook was simply the highest alpha hop I had on hand, for maximum bitterness and no real flavor contribution. And I really liked the added fermentability from the pound of piloncillo I added in the boil to Old Froglegs, so I added simple sugar to the kettle here in the form of light agave nectar. I mashed at 149°F for 90 minutes, collected 9.5 gallons at 1.069 and then boiled for about 2 hours to achieve an OG of 1.101. The beer fermented for 4 weeks before it was racked to secondary to age for another eight months. When it had smoothed out to my satisfaction, I bottled it with a half-pack of Danstar CBC-1. This is an incredible yeast for bottle conditioning. I highly recommend it when bottling beers with high ABV, after long aging, or both. It’s made specifically for bottle conditioning, but it’s not always easy to find, so in a pinch one can use champagne yeast. The FG was 1.016, yielding a final ABV of 11.3%. I designed a label and named the beer Gnome Brew Wheatwine in honor of our daughter Vesper (Confused? Let’s just say that nicknames given to newborns before they’re discharged from the hospital have a habit of sticking around in my family). So how did it come out? To be honest, it’s been in the bottle for less time than it was in the carboy, so it’s still mellowing, showing rapid improvement month to month. I’ll know for sure how it is this month when I open a bottle on National Homebrew Day for a side-by-side tasting against my 3-year-old barleywine. So watch this space, because I’ll be back next week with tasting notes for both beers. Thoughts or questions about the recipe in the meantime? Comment below, or find me on Facebook. Happy National Homebrew Day a few days early … and until next week, cheers from myBrewHome to yours. Big beers seem to be the norm for some homebrewers. The word “imperial” is thrown around at homebrew club meetings more than at Star Wars conventions, and barleywines seem far more prevalent at the homebrew level than commercially. I suspect many people become homebrewers just to hoard gallons of nose-hair singeing strong ales for a fraction of the cost of buying it commercially. Not me. I mostly drink beers around 8% ABV or lower, and my brewing habits reflect that. Oh, but there’s nothing like having a baby to change your perspective. Faced with responsibility for an adorable but needy new organism while surviving on Clif bars and fifteen hours of sleep a week, the most intimidating non-baby-related activity in the world sounds like a vacation. That first month, I probably could’ve been talked into skydiving. So when someone suggested I brew a barleywine to commemorate Lucian’s birth, my enthusiastic response of “WHY THE HELL NOT! ?” was, I’m sure, loud enough to be heard across the Texas Hill Country. I decided to make it the first beer I brewed after he was born. I started with a name: Old Froglegs American Barleywine, after a nickname we gave Lucian within hours of being born (his legs were constantly crossed as a newborn). The recipe was big but simple, in keeping with my recent emphasis on fewer carefully chosen ingredients. 19 pounds of Maris Otter formed the base: a premium malt more expensive than plain American 2-row, and on a grain bill this big cost adds up. But Maris Otter has great flavor, and besides, how many “first beer after my baby was born”s do you get? I added 3 pounds of light Munich for melanoidins and a half-pound each of Crystal 60 and Crystal 150 for caramel and dark fruit notes. If you’re counting, that’s 23 pounds of grain (plus rice hulls) that would go into my 10-gallon cooler mash tun. 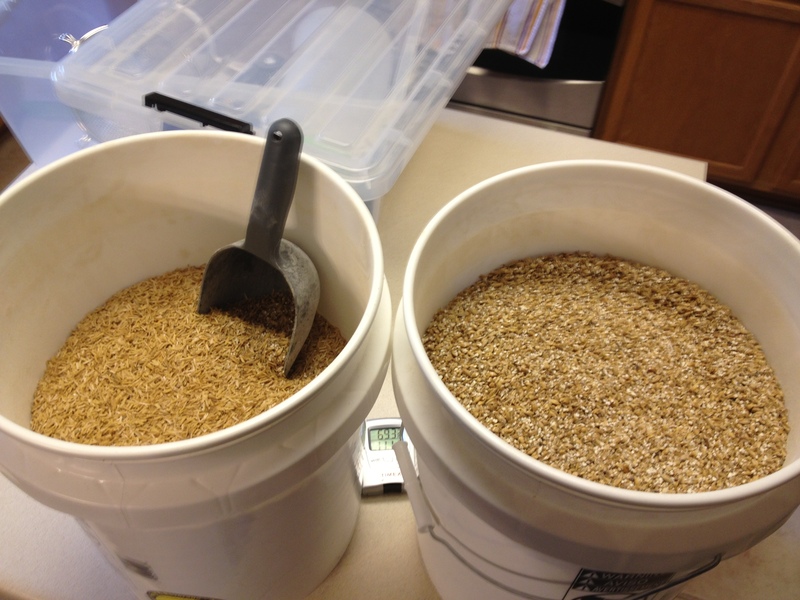 By milling my own grain I hoped to achieve a finer crush than what I’d get at the homebrew store – admittedly a crap shoot, not knowing how their mills are set. I didn’t actually buy my new Barley Crusher MaltMill for this brew, but it happened to be its maiden voyage. Earlier this year I realized that brewing with a newborn around would require flexibility, since daddy tasks might pop up unexpectedly on the weekend (I was right). With a malt mill in my arsenal, I can buy unmilled grain and crush it on brew day, ensuring fresh malt even if brew day is postponed by a week or more. Pictured above: the quantity of grain known to maltsters as a metric assload. I doughed in at a stiff 1 qt/lb and added the rest of the liquor (to 1.25 qt/lb) only after I was sure that my mash tun would fit it all. It did, barely. I sparged to collect just shy of ten gallons of wort, which didn’t fit in the brew kettle, so I saved the extra in a pitcher and added it to the kettle as it boiled down. I didn’t actually start the boil timer until all the wort had been added and boiled down to my usual starting volume. All in all, the boil lasted about 150 minutes. On the edge of boiling over. He’s a madman! A maaadmaaan! Once boiling was underway I added a pound – 2 pressed cones – of piloncillo (a.k.a. panela), an unrefined cane sugar particular to Latin American cuisine. I’d had it in the pantry for some time and it seemed a great addition to a barleywine, with its rich molasses flavor and high fermentability leaving the beer high in alcohol and low on cloying sweetness. Protip: smashing the cones with a meat tenderizer before adding them is great stress relief. I added only 60-minute hop additions to the boil for bitterness. I had 1.75 ounces of Warrior and 1 ounce of Galena in the freezer, so I used them. I also added yeast nutrient to the boil because of the high gravity and 4% adjunct sugars. I met my gravity target and then some, achieving an OG of 1.114. I pitched 2.5 packets of Safale US-05 dry (I ran out of time to rehydrate) and it took off like a rocket, with bubbles coming through the airlock less than 16 hours later. Two weeks later, the beer was at 1.023, which appears to be its final gravity. I racked it to a carboy at the end of May. It’s going to stay there for months. I plan to bottle it in November so it’s ready to drink on Lucian’s first Christmas. Since I’m not an everyday barleywine kind of guy, I’ll save it for special occasions, birthdays and other milestones. I think I can get several years of good aging out of it if I treat it right. Even if it starts to decline after a while, I have to save at least one bottle to share with Lucian on his 21st birthday. And then I can embarrass the hell out of him with the Froglegs thing. I’m pretty sure every homebrewer and beer geek has at least one personal story about how they surprised – and perhaps even converted – some non-craft drinker they know with the awesome power of real beer. Maybe one night in college you handed an Imperial IPA to your malt liquor chugging buddy, and he quickly commended it before twisting open another 8 Ball. Or maybe you once convinced a co-worker to try a fruity wheat beer at a happy hour instead of a hard lemonade, and she now stocks her fridge with lambics. Or maybe you triumphed over decades of wine supremacy by pulling off a really successful beer pairing with a dinner, to the amazement of friends and/or family. My latest such story is a variation on that theme: a 3-course dinner with beer pairings, served in my own dining room. The day was Thanksgiving (November 22 for those reading outside the U.S.) and the objects of my proselytization were my wife Lisa’s family: my mother-in-law and father-in-law in town from New Orleans, and my sister-in-law and her husband visiting from the United Kingdom. To set the stage, let me introduce them instead as: a coffee drinker, a whiskey drinker, a Bud Light drinker, and a foodie/pub manager from the south of England. Out of everyone in attendance, Lisa was the only person who was as convinced of the greatness of this idea as I was. She co-envisioned this event with me but couldn’t join us in the beer tasting thanks to an unfortunate medical condition called “expecting our first child” that isn’t expected to clear up for several months. This toast is for you, X. The dinner itself was rather unorthodox. We haven’t done turkey on Thanksgiving in my house for nearly ten years, and saw no good reason to start now. We decided to build an utterly un-Thanksgiving-y menu with several commercial Central Texas beers from my cellar as inspiration, while also giving everyone in the family a chance to cook something. Here’s what we came up with. I should disclose at this point that I don’t usually cook. Brewed beverages and the occasional steak are all I make that’s fit for human consumption, so most of the actual cooking (except for the steak) was done by Lisa and my brother-in-law. But I did choose the beer, so I’ve snatched the right to bill myself as director of the whole production. Salad Course: Romaine with blue cheese, pecans, dried cranberries, and homemade mustard vinaigrette paired with a bomber of South Austin Brewing Company Saison D’Austin. As a longtime fan of this ubiquitous local saison, I had been dreaming about this pairing for a few days beforehand. This is a very light and refreshing saison, and everyone at the table enjoyed it (especially my sister-in-law the Bud Light drinker). But I found it lacked the backbone to stand up to the bold flavors of the blue cheese and mustard. Something with a bit more spice and/or funk would have served the dish better, so next time I’ll go with something a little more intense – a more phenolic Belgian or something with some Brett – and save the Saison D’Austin for a cheese course. Main Course: Grilled sirloin with a coffee-chipotle rub served with a relish of tomatoes, tarragon and mustard; dill-roasted tricolor potatoes and oven-roasted asparagus paired with a bomber of Jester King / Mikkeller Weasel Rodeo Imperial Oatmeal Stout. The rub and the steak were the only food items I prepared myself, carefully trying to match the flavor profile of the beer, which features chipotle and kopi luwak coffee. Coffee and pepper were more pronounced in the steaks than the beer, if I do say so myself. But the pairing was a match made in heaven, and the in-laws enjoyed it all so much that we actually drank not just one bomber of Weasel Rodeo, but also the second bomber I had chilled just in case. Dessert: Pecan pie from the Salt Lick paired with a 12-ounce bottle of Real Ale Sisyphus Barleywine Ale from 2011. Okay, so we didn’t actually make the pie, and I had no idea how it was going to pair with the 2011 Sisyphus, which I had never tried. As it turned out, the rest of the family were stuffed and satisified by now, so the barleywine was shared by me and my brother-in-law alone; 6 ounces for each of us was more than enough. The beer was robust and nutty with toffee overtones, and I thought quite a good match for my favorite pie in the Austin area, though I found myself wishing I had some good vanilla bean ice cream to complete the ensemble. I wasn’t disappointed for long, though, because I soon found myself satiated and … well, let’s just say “sleepy”. So. A fantastic dinner that we had fun preparing together, and a great opportunity to demonstrate for visiting family why I’m so excited about the Central Texas beer scene. Hopefully I even got them thinking about beer in new ways. Would I do it again? Hell yes. And since there’s nothing “Thanksgiving” about this meal, I may do it again before next year’s holiday season. I hope it inspires you to try something similar.